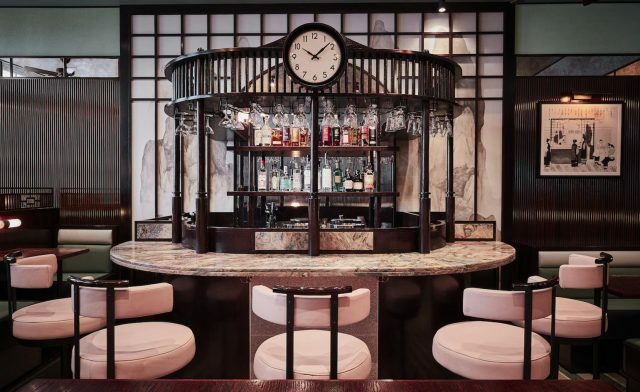 A cinematic reinterpretation of 1930s Tapei from the talented trio behind Bao and Bubbledogs, Xu in Soho oozes old world glamour, from its old fashioned clock and sea green upholstery to its powder pink bar. It even boasts a mahjong room. Designed by Brady Williams, who also worked his magic on Corbin and King’s Fischer’s in Marylebone, pink marbelling, rich wood panelling, wooden ceiling fans and hand painted murals abound in this cosy, classy space, which makes a feature of its emerald laquered tea kiosk. There’s even an adorable table for one for those dining solo.